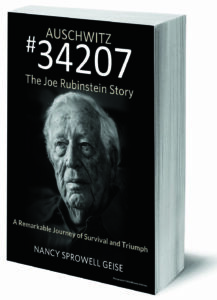 Auschwitz #34207: The Joe Rubinstein Story by Nancy Sprowell Geise is an unforgettable book. I sometimes avoid books about the Holocaust, for obvious reasons—it hurts. It can be hard to read how horrible humans were to other humans. It’s important to remember what happened, though, to bear witness if only as a reader. Joe’s story pulled me in and wouldn’t let me go. By the end of the book I felt uplifted, even joyful, because Joe made it despite the odds against him. He survived and his strength puts the small challenges of life into perspective. I’m so glad I read this book and I now carry Joe’s story in my heart. 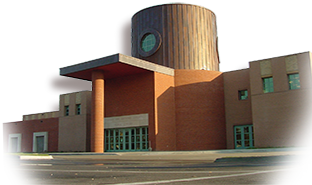 Nancy Sprowell Geise will join us on International Holocaust Remembrance Day, January 27, at 2 pm, to talk about Joe’s story and her experience sharing it around the world. Geise said it’s important to read and learn about the Holocaust and to mark remembrance days. Joe showed incredible courage in making the decision to tell his story. Originally he wanted Geise to help him share his story with his family. Joe wanted them to know about their family from Poland and what he had endured, but it was so painful to talk about that he had never shared much. Joe’s story has indeed reached readers around the world, and readers say that hearing what he survived gave them strength. Recently, Geise was asked to share Joe’s story with guides and volunteers at Auschwitz as part of their training. The memorial hosts millions of visitors a year and the guides are surrounded by heartbreaking stories. Read on for the full text of our interview with Nancy Sprowell Geise and check out the booklists below for recommended reads on the Holocaust and Jewish heritage. In an interview for The Topeka Captial-Journal, you said that during a chance meeting with Joe Rubenstein, he told you he wanted you to write his story. Why do you think he decided to share his experience with you, when he had initially told you he did not want to do so? As he was growing older, I think he realized that once he was gone, it would be too late for his family to know about what he endured, and more importantly, for them to know about his/their family from Poland—the ones who perished in the Holocaust. For until he shared his story with me, even talking about his mother and siblings was so painful for Joe that he had rarely done so. Knowing that I had recently published my first book, The Eighth Sea, Joe wanted me to hear his story and then write it for his family to read. He wanted them to know what he had been through, but he didn’t know how to tell them. After hearing a little of Joe’s story, I told him I thought it was a story the world should hear. Why is it important to revisit stories from such a dark time? Why is it important to remember the Holocaust and to mark the tragedy with an International Day of Remembrance? All Holocaust commemorations and remembrance days are important for us to pause and remember the precious lives lost and destroyed during Holocaust. International Day of Remembrance is a reminder that evil isn’t a single country’s issue … when left unchecked, it has a way of spreading throughout the world. We know that history has a way of repeating itself, and sometimes that way is terrible. Hearing stories like Joe’s puts a human face to the stark statistics of the millions murdered during the Holocaust. Before the war, Joe was a typical teenager. He loved life and he loved his family. He worked hard to help his widowed mother keep food on the table. He didn’t know much about what was going on in the world. He of course had no idea of what was to come. And the same can be said of all of us—none of us knows what the future holds. During the Holocaust, Joe lost nearly everything a person can lose, including everyone he knew and loved. Every day since Joe makes a choice how to live his life … he can live it immersed in bitterness and anger, instead he chooses joy. Each of us has that same choice in how to live our lives. Remembering the Holocaust is a reminder that love and hate starts in the hearts of each of us. And it is a reminder that we have to be vigilant and aware of the forces of evil, and when necessary, hold at bay and battle against those intent on killing others. You have spoken around the world about Joe’s story. Recently you spoke to guides at Auschwitz itself. Tell us a bit about that experience. I was asked to share Joe’s story with the guides and volunteers as part of their beginning of the year training in 2018. It was humbling and emotional to say the least … and an honor of a lifetime. Auschwitz is a memorial as well as a museum, and for me being there was walking on hallowed ground. Until going there in person, it is hard to describe the feelings it evokes. The magnitude of what happened there is nothing that can be put into words. Because Auschwitz gets millions visitors a year, the guides share the history in over 20 languages, and not all the guides speak English. So as I spoke to them, the director of the guides translated for them. Afterwards, several came up with tears in their eyes and commented on the impact Joe’s story had on them and they were so grateful for Joe for telling his story and so happy to know that he is still alive and went on to live such a fulfilling life. They work surrounded by such heartbreaking stories. The vast majority of those who were sent to Auschwitz never lived to tell their stories, so I think it must be very emotional and impactful for the guides to hear new stories of people like Joe who did survive the unimaginable, who were able to carve a meaningful lives for themselves. You spent two years interviewing Joe to gather the details of his story. I imagine it was often hard for him to tell the horrific details, and hard for you to hear them. Do you have self-care or coping tips you would share for those who have a difficult story to tell, or for writers who want to help someone tell such a story? This is probably a good time to encourage others to do what I say, not what I did. Writing is hard on a body for sure – not only physically but also emotionally. For me, writing requires hours and hours of sitting. There were many, many days when my husband would leave for work at 7am and he would return in the evening and I was still sitting in the same place writing away. So no matter what I am writing, for me, it takes a toll on my body. For all writers, and especially for those who tackle emotionally hard projects, I think it is important to find a physical outlet – exercise, walk daily, and most importantly have someone with whom you can talk. I could not have written Joe’s story this without the support of my husband who was just so good at listening and understanding the times when I literally just needed a shoulder to cry on. In the beginning, I was actually fearful of writing it, for until doing so, I avoided Holocaust stories because I didn’t think I could bear them. Whenever I got really down, I would think, “If Joe lived this, I ought to be able to write it.” And then I would just push on. Other people have said that they were afraid to read Joe’s story for the same reason, but then after they did, they were glad they had done so, because although it is a heartbreaking story, it is also a tremendous story of hope and triumph of the human spirit. What helped is that woven throughout his story are instances of inexplicable people and events that keep occurring to save Joe’s life. And after the war, some truly remarkable and hilarious encounters kept happening to Joe that had me spellbound and laughing aloud while I wrote about them. How have readers responded to your book? Part of why Joe never wanted to share his story was that he didn’t think anything good could come from doing so. Now, as we hear from people around the world who find comfort and hope in how he went to live a rewarding and joy-filled life, even after losing so much. They know if he found a way to go on, then they can face whatever they are dealing with. We get heartfelt emails from people around the world. A German police officer wrote to tell me the life changing impact the book had on him. Another man wrote to say that because of Joe’s story he is planning to move back to Poland to see if he can get hired as a volunteer guide there. A survivor from the concert shooting in Las Vegas came to me after a presentation and said that until she heard Joe’s story, she wasn’t sure she could be able to go on living – she was just so traumatized and filled with survivor’s guilt, but after hearing Joe’s story, she knew that if he found a way to go on living after losing everyone he knew and loved, that she knew she could find a way to live with her trauma. Joe called me the other day, he is 98 now, and he said that his age, every day is a gift from God. I told him that I think every day is a gift for all of us. What are your top book recommendations on the Holocaust for readers, both fiction and nonfiction? There are so many powerful books out there, with new ones still coming. Certainly the pillars of all Holocaust learning are The Diary of Anne Frank, Night, Man’s Search for Meaning and All But My Life: A Memoir by Gerda Weissmann Klein. One of my favorites is The Hiding Place by Corrie Ten Boom. Since writing Joe’s story, I have the opportunity to meet several other holocaust survivor authors and hear of their stories. A professional friend of mine, Anthony Pitch, wrote a powerful book that I highly recommend called Our Crime Was Being Jewish: Hundreds of Holocaust Survivors Tell Their Stories. I’ve just started reading Life in a Jar: The Irena Sendler Project by Jack Mayer with a remarkable Kansas connection. Posted in Books, Movies & Music and tagged holocaust, nonfiction.